Empire Coin and Valuables, Pocket Watches. From their development in the 16th Century until the wrist watch became popular after WWI, Pocket watches were widely used & coveted. Pocket watches were usually attached at the bow by a chain, commonly called a fob, which allowed them to be anchored to a vest, lapel, or belt loop to prevent them from being dropped or lost. Although pocket watches were being regularly manufactured by 1594 they only had an hour hand until the late 17th century. It wasn’t until the latter part of the 1830’s that the first American pocket watches, made with machine-made parts, appeared. Women’s pocket watches usually had a fob that was more ornamental than useful. As time progressed, most pocket watch chains became more decorative. Many of these fobs were made of gold, but the more readily available and commonly used were those made of gold filled. They could be decorated in enamel, carry logos of Clubs or Fraternal Orders, they might also carry practical gadgets such as winding keys, cigar cutters, or small pocket knives. Some types of Pocket Watches were frequently use by railroad employees and eventually they became synonymous with train conductors. There are a large number of companies that have made pocket watches over the years, the most common are Ball, Burlington, Columbus, Dudley, Elgin, Fredonia, Gruen, Hamilton, Hampden, Howard, Illinois, Ingersoll, Keystone, Rockford, Seth Thomas, South Bend, US Watch, and Waltham, although most high-end watch companies have made pocket watches at one time or another. The two most popular styles of pocket watches are Open Face and Hunter Case. The Open Face lacks a metal cover to protect the watch crystal, and it is common for the bow and stem to be located at the 12:00 position. 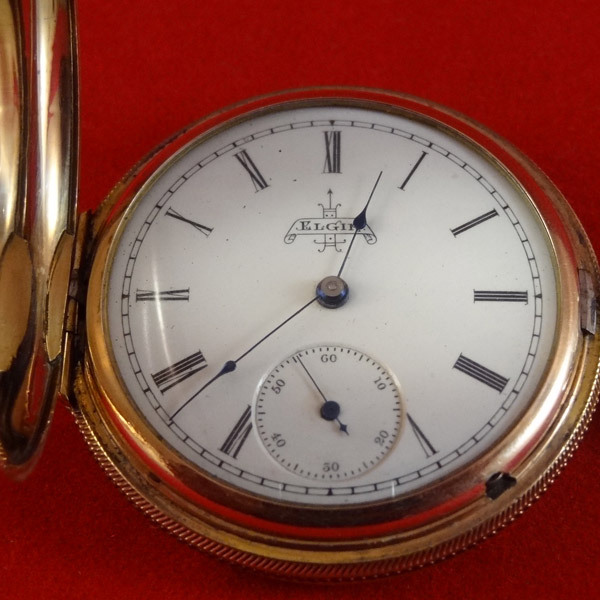 Occasionally a watch intended for a Hunter Case will have the winding stem at the 3:00 or 6:00 position and these became known as Sidewinders. Eventually, pocket watches approved for railroad service were required to have the winding stem at the12:00 position, although most Hunter Cases usually have a hinge at the 9:00 position and the Crown and Stem at the 3:00 position. Most modern pocket watches can be set and wound from the Stem, which was a technique pioneered by Patek Philippe & Co in the 1850’s. Prior to this, a key was required to wind the mainspring as well as set the time. As a variation to the Stem wind and set pocket watches, there was also a type called lever set. This technique requires removal of the crystal and manipulation of a lever (usually located at the 10:00 or 12:00 position) before the Stem can be used to set the time. This variation was required for all pocket watches used on the railroads to ensure the accuracy of time-keeping. Pocket watches were pivotal to engineers and conductors in the early 1900’s, if they weren’t accurately synchronized, locomotive collisions could result. One of the main components, as well as an indicator of the quality of a pocket watch, are the number of Jewels it contains. There are several different numbers of Jewels in pocket watches, but for the movement to be considered “Jeweled”, there must be at least 7. The most common numbers of Jewels in pocket watch movements are 7, 11, 15, 17, 21, 23 and 25, although to be considered “fully Jeweled” a pocket watch must contain at least 17. While a number of high-end, more expensive railroad models contain more then 17 Jewels, the operational value of Jewels beyond the 17th is often debated. Lastly, pocket watch movements are usually marked “adjusted”, which indicates that the watch has been tuned and keeps accurate time under various conditions. These conditions include six positions (sitting down with the dial up, dial down, pendant up, pendant down, pendant left, and pendant right), testing at temperatures between 34-100 degrees Fahrenheit, and Isochronism, which is the ability of a watch to keep time regardless of how tight the watches mainspring is wound. Although we have covered the most common styles of pocket watches, there are a number of other aesthetic and more esoteric variations. © Empire Coin & Valuables. All Rights Reserved.